Pakistani warplanes have attacked suspected pro-Taleban positions near the Afghan border for a fourth day. The army says a total of 45 troops and 150 rebels have died so far in battles around the town of Mir Ali. Tuesday's air strikes left 50 rebels dead, unconfirmed reports say. Locals, fleeing the area in their thousands, say many civilians died. 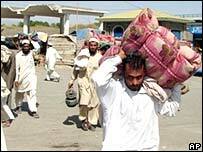 It is the heaviest fighting for many months in North Waziristan, which the US says is an al-Qaeda safe haven. Pakistan's President Musharraf - a vital ally in the US-led "war on terror" - is under pressure to do more to stop militants crossing into Afghanistan, where violence this year has soared. The BBC's Barbara Plett in Islamabad says that Mir Ali is known as a base for foreign militants with links to the Taleban and al-Qaeda. The violence has been escalating since mid-July when a ceasefire between the army and the militants broke down. Access for journalists to the tribal areas is restricted and it is impossible to independently verify the casualty figures. The army has been bombing suspected militant positions in villages using helicopter gun ships and jet fighters. "There were militant hideouts in the area near Mir Ali, aircraft targeted these hideouts on Tuesday but I don't have the number of casualties from that," army spokesman Maj Gen Waheed Arshad told the AFP news agency. 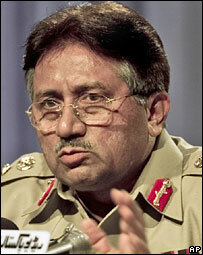 Local officials said about 50 militants had been killed but the military has not confirmed this. Residents counter that it was civilians who died when fighter jets bombed three villages. In the worst case, they say, a crowded bazaar was rocked by about a dozen explosions. Locals described scenes of carnage. Doctors in a nearby town said they were receiving injured people between the ages of two and 50. Latest reports say many of Mir Ali's residents are trying to escape, but it is unclear how many are going. One man interviewed by the BBC Urdu service on Tuesday said that his nephew had been killed by army shelling. The Associated Press news agency quoted another as saying homes and shops in his village, Epi near Mir Ali, had been destroyed and dozens of people killed. "Some did not have heads, hands or legs. Some people were searching for their children and women," the man, Abdul Sattar, told AP. 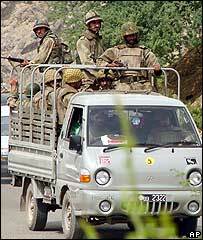 Traditionally, the security forces kept out of the tribal border areas. That all changed in 2001 after Gen Musharraf allied Pakistan to the US-led "war on terror" and vowed to crack down on militants based there. For much of that time there has been a heavy military presence in Waziristan. But militants have still managed to increase their influence and control in many areas. Hundreds of soldiers have been killed. But critics say the military has not done enough to crack down on the militants. Moreover, elements in the army and the intelligence services have been accused of helping them. The military campaigns are deeply unpopular in Pakistan as they are widely seen as being carried out under American pressure. Another batch of more than 200 soldiers were captured recently by militants, apparently without a fight. The militants say they will kill them unless a number of prisoners are released and military deployment ends in their area. So far, a number of the soldiers have been freed, while several others have been killed. The army says more than a dozen soldiers who went missing on Monday are still unaccounted for.